olden days: The Davis-Fischer Sanatorium was renamed Crawford Long in 1931. 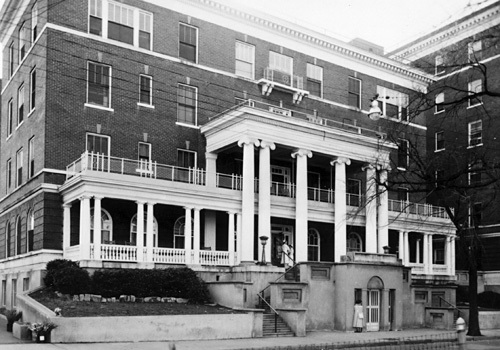 Just three years after the Davis-Fischer Sanatorium opened in 1908 in downtown Atlanta (near what is now Turner Field), founders Edward Campbell Davis and Luther C. Fischer decided to move it to its current location. But the new hospital expanded rapidly, its beds, doctors, and patients multiplying in step with the growth of the city around them. Now called Emory Crawford Long Hospital and situated in the heart of hectic midtown Atlanta, the facility celebrates its centennial anniversary this year with a series of events open to the community. That same year, Fischer deeded Crawford Long to Emory’s School of Medicine to enrich the University’s medical education. The transfer of the hospital, valued at $1 million, was final in 1940. During a century of dramatic medical and technological advances, Emory Crawford Long’s evolution mirrored that of health care and society writ large. In 1918, the Davis-Fischer Sanatorium overflowed with victims of the Spanish flu pandemic even as physicians including Davis served the troops in the war overseas. A few years later, as the Roaring Twenties swept the country, a nurse was fired in 1923 by Fischer for having bobbed hair, but appealed to Davis—who had five daughters—and was rehired. In 1931, the hospital was renamed Crawford Long for the Georgia physician credited with pioneering ether as an anesthetic. Long, who received an MD from the University of Pennsylvania in 1839, had seen traveling showmen use nitrous oxide or “laughing gas” to play tricks on subjects and entertain crowds; he also had observed its effects at parties, where people used it for fun. He began experimenting with the gas during surgery and found it to be effective, although he was not fully credited with his groundbreaking work until after his death. In 1934, a baby was born at Crawford Long in the first air-conditioned delivery room in the Southeast; in 1939, the first triplets ever to survive Caesarian section in the United States were born there (sadly, the mother did not survive). In 1940, a new School of Nursing building opened on the hospital campus, offering a rigorous three-year program for 180 student nurses. The following year, work began on a new maternity center named in honor of Emily Winship Woodruff, mother of George and Robert Woodruff; but Pearl Harbor and ensuing engagement in World War II nearly would halt construction. The building opened at last in 1945. In 1947, the first daycare center for hospital employees in Atlanta was established at Crawford Long. The hospital made international news in 1967 with the birth of the 200 millionth American, Robert Ken Woo Jr., who was featured in a five-page spread in Life magazine. In 1974, the first open-heart surgery at Crawford Long was performed; in 1996, the hospital treated athletes, officials, and guests of the summer Olympics. And in 2002, the new Emory Crawford Long Hospital opened, the result of a $270 million redevelopment project designed to consolidate and update the hospital campus. The 511-bed, acute-care teaching facility now centers on a six-story, 500,000-square-foot diagnostic and treatment center topped by a fourteen-story medical office building, and is staffed by some 950 Emory medical faculty and about 600 private-practice physicians. The hundredth anniversary celebration was highlighted by a historical exhibition, hospital tours, and a community prayer breakfast attended by Mayor Shirley Franklin as well as Emory and Crawford Long leaders past and present. “This is a unique and exciting opportunity for Emory Crawford Long to join with our community and employees as we reflect on the tremendous history of this institution, while also looking forward to an exciting future of serving Atlantans with the most cutting-edge, research-based medicine and technology,” says Chief Operating Officer Dane Peterson.